Spring is here, and that means it's time for another update from our home park Six Flags Discovery Kingdom! Special events for Spring Break are currently underway park wide, with a specialty celebrity guest making an appearance during our visit today! We'll also take a look at the recently opened Pacific Rim 5-D Experience and the massive Joker Construction Site! Guests are treated to a iron and steel masterpiece before they enter the park due to The Joker's prime location. The little speck people on the ground should give you perspective on the Joker's prodigious footprint! New signage advertising the Pacific Rim 5-D Experience is plastered somewhat sporadically around the park. 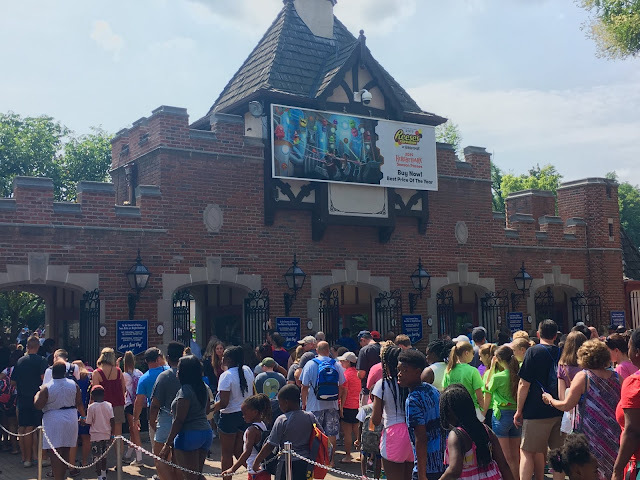 After entering the park, a suspicious clustering of teenage girls and security personnel congregated around the opening plaza. But what for? Though I had no idea who he was, Cameron Dallas made an unannounced appearance at the park during my visit. He is a "Social Media Star", according to the female members of my group, though I couldn't get any more information from them as to why he is so famous. Park guests seemed to be enjoying his appearance, so go figure. Moving on, time to check out the new Pacific Rim 5-D Experience! Signage for the attraction partially lines the queue line into the theater. Along with the signs, this salvaged truck is the only exterior theming for the ride. It's possible that the park didn't splurge on anything expensive or permanent due to future plans for different films in the Iwerks theater. After receiving your 3-D glasses, an extensive Pre-Show delivers the first story line on the attraction. The video is basically spliced clips from the film that explain the story, with no new or original material for the ride. The theater has a decent seating capacity, and the seats have a good range of motion. 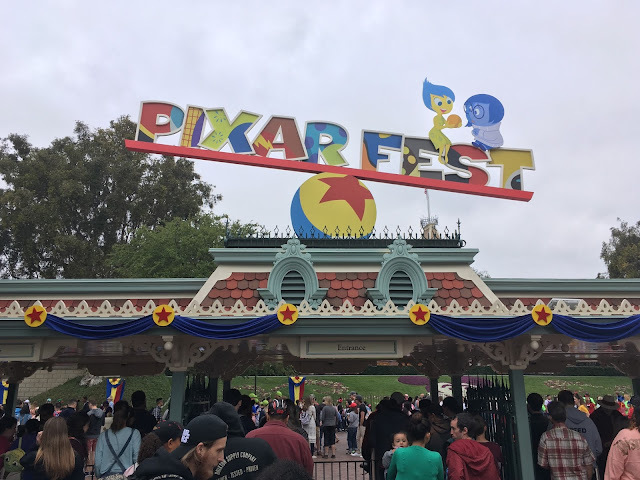 Maybe this is because I'm used to the high quality simulator attractions at Universal Studios, but the whole attraction itself felt a little lackluster. The actual ride, like the pre-show, is the exact climax fight scene from the Pacific Rim film. Nothing new or original was created for the ride. This affects the experience considerably, as simulator films are generally created specifically for the film with a first person POV perspective. The film clips have motion and action, but syncing actual movements with the film is difficult due to the standard movie perspective the original film was shot in, The motion, though forceful, seemed unsynchronized and independent from the film. Additionally, no water or "5-D" effects ever hit me or anyone in my group during our ride. Keep your expectations for this "attraction experience" low, and look at it more like a glorified movie trailer for the film. Moving on, new banners showcasing all the parks in the Six Flags chain now line the back pathway of the park. A new JB's Barbeque and Sports Bar is currently under construction in the park's food court section. Over in Roar Plaza (This needs to be renamed) progress on The Joker is unmissable! A new game appears to be under construction at The Joker's future exit...Possibly a Joker themed game? A little work seems to be happening in the station. Over in the ride's epicenter, crews were active all day performing track work. It appears the crew workers were etching out the painted track sections where the wheels come in contact with the track. This is Rocky Mountain Construction's first installation to include this feature to prevent against the ugly worn out railing ubiquitous to roller coaster track. Though V2 was down for "Maintenance", it appears that Joker Construction Equipment was the real culprit! 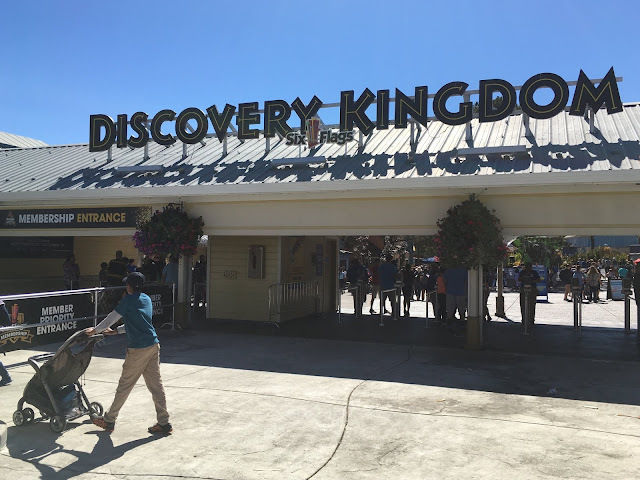 The future is bright for Discovery Kingdom! Summer can't get here soon enough! That's all for now from Theme Park Overload. Make sure to "LIKE" our Facebook Page for Breaking News Updates and Exclusive Content! My name's Nicholous, and Thanks for Reading!